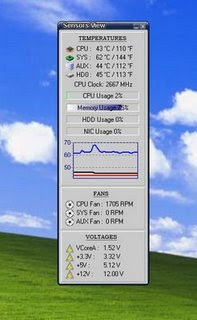 Also It Monitors the speed of all the fans in your system. And also generates graph of all the data it collects. it also show the voltages thourgh you system. An additional provision in Sensors View is that it shows the temperature of the CPU in the system tray even it is closed, so that we can always get alerted of the CPU Temperature.